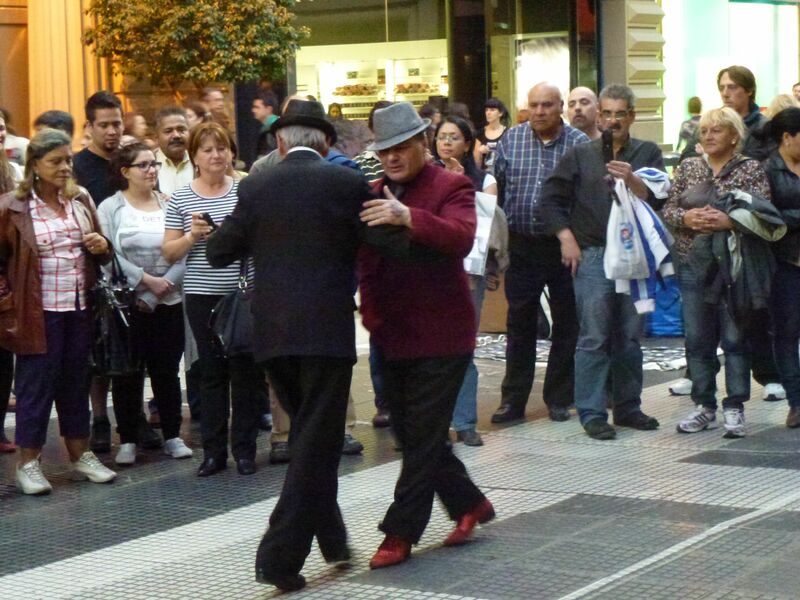 Tango was danced between men from the very beginning, since it was considered too immoral for women, although clearly this is only a part of the explanation of man-to-man dancing, and a fuller account is given here . I cannot vouch for its accuracy, but the site at least has some nice videos of men dancing with men. The street where I took the photograph is the Calle Florida, which, apart from being the most famous street in the city of Buenos Aires, is closely associated with Borges and all things Borgesian – he lived nearby for many years and was frequently to be seen taking a stroll here. In fact a number of anecdotes about bumping into Borges take place in this street, which also boasts a version of Harrods, smaller than the one in Knightsbridge and currently closed down, but a famous landmark of the city. It opened in 1914 and closed in 1998, but has long been expected to re-open, subject to an extended lawsuit, following its acquisition by Swiss investors. What do you say to such a person? That the world is wicked; that dancing in the street never made anyone an honest crust; that we are all destined to be dust; that there is no afterlife? I despair. I continued on my way, to give my talk at the Translator’s Club, and answer questions on topics which, as always, I felt utterly unauthorized to speak about. But this is one of the hazards of being a person impersonator: your grasp of reality is frail and you often forget who it is you are meant to be impersonating; and although yesterday Blanco claimed to be the poet and translator Richard Gwyn, tomorrow he might just as easily turn into an extra from a Nazi zombie movie or invent a cure for hiccups.